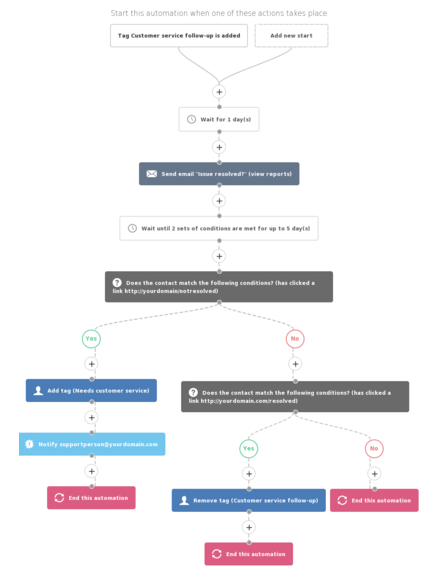 When you’re trying to use automation for your business, it can be helpful to have some pre-built automation workflows to help you out. ActiveCampaign has a ton of pre-made automations for you to choose from. You can visit the Marketplace, explore the in-app pre-built automations, or create automations and share them yourself. Even if you don’t use automations exactly as they’re made, seeing what you can use automations for is helpful. And you can always tweak a pre-made automation template or recipe for your business. 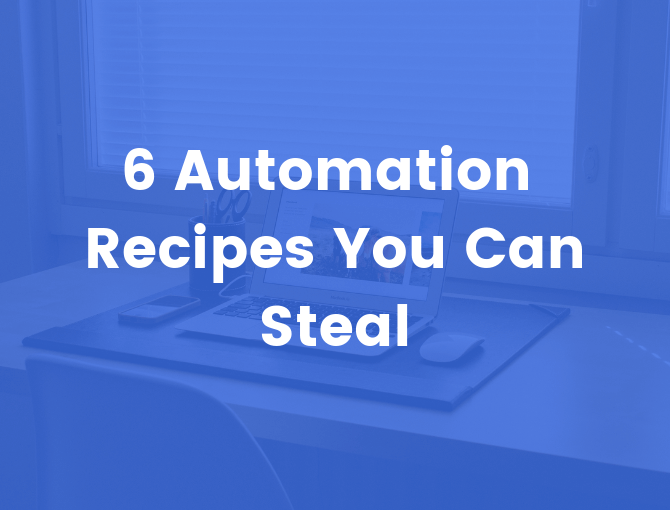 So here are six automation templates you can import right now. This automation assumes that you have two versions of your website: a “www” version and “no subdomain” version. If you only have a single version of your website, just delete these extra conditions. 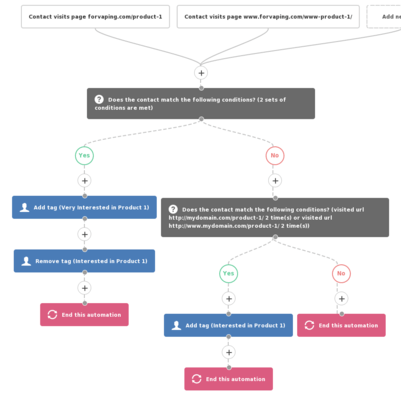 This automation delivers content that is aligned with products a contact is interested in. It begins when a product interest tag is applied. It could deliver content and offers that are related to the product they are interested in. You can “stack” this one on top of the previous one (“Product interest tagging”). There are two automations — one for “extremely interested” and one for “interested.” The “extremely interested” follow up is a bit more aggressive with the timing of messages and might include more calls to action. There is no email content included with these automations. You will need to create the content for these emails. This is only a suggested follow-up sequence. 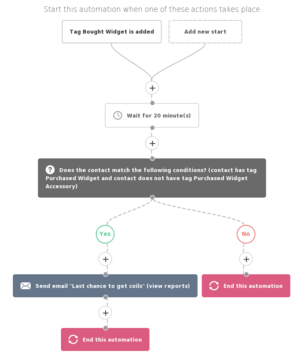 If you are going to “stack” this automation with the previous one, you will need to make sure that the interest tags you apply in the previous automation match with the tags you are using to trigger this automation or this automation won’t begin when the interest tag is applied. 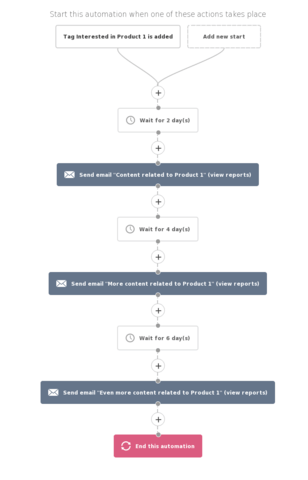 You would want to end this automation when a contact purchases the product it targets so that they won’t receive an email that there is a sale on the product after they’ve purchased it (which would be upsetting). Send out a “how can I help you?” email after a contact visits help documentation. If they are a customer, they get an email from customer support. If they aren’t yet a customer, they get an email with replies going to someone in sales. You probably would want to set this automation to “run once” so they don’t get this email every time they visit your help docs. When prompted by the import wizard, edit the URL to reflect the URL of your help documentation. If a contact is given the tag “Customer service follow-up” it will trigger this automation that waits a day and then checks in. If the customer clicks the “not resolved” link, it will notify your support person they need to reach out to them, and redirect them to a form to collect more information. If they click the “resolved” link, it will remove the tag. The links in the email should redirect to actual pages on your website. The happy face should go to something along the lines of “Noted! Glad we were able to help!” and the sad face should redirect to a form that could request more information about the unresolved issue so that when the customer support person goes to follow-up, they have more information to go on. When the import wizard prompts you at Step 2, select campaign “Issued resolved?” and edit the link to be your resolved link. Edit the “or” condition to be your “not resolved” link. At Step 3, input your “not resolved” link. At Step 5, input your “resolved” link. If someone is ignoring your emails, they are harming your deliverability. These uninterested contacts are making it so your interested and engaged contacts, the ones who really want to hear from you, never even see your messages because they are filtered away from their inbox. You want to make it really, really easy for these uninterested contacts to leave. 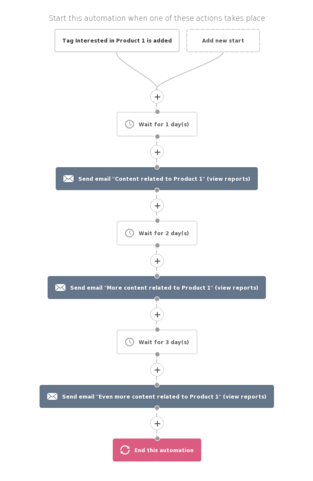 This automation politely invites a contact to unsubscribe if they haven’t shown any signs of engagement in two weeks. This automation looks for engagement. 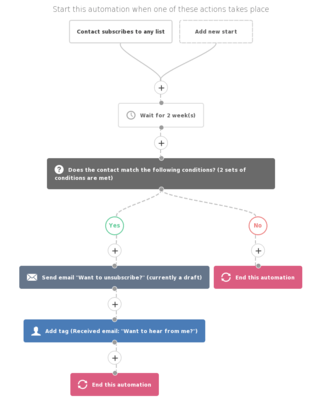 If there are no email opens or clicks after two weeks, it sends them a “Do you want to leave?” email. If they click the unsubscribe link, it removes them from the list. 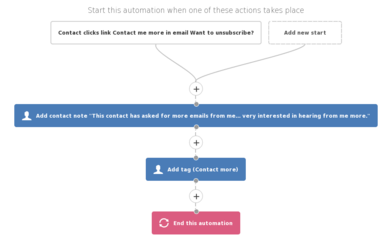 If someone clicks to hear from you more, this automation will tag them as such so that you can create a segment of these “very interested” subscribers and send to them more often (as requested). This automation sends out an email when someone buys a certain product but does not buy an accessory product. It checks for certain product tags. If they have the product tag but do not have the accessory product tag, it sends them an email to ask if they want to add that item to their order before it ships. This basic idea could be used to upsell or cross-sell with related products — but works best with accessory products they’ll end up needing anyway. For instance, if they bought a SLR camera but no film. It doesn’t have to be a “before it ships” offer. You could delay sending by one week and then ask them if they’d like to purchase the accessory item at a discount. If you like us sharing automations, please give us suggestions for what kind of automations you’d like us to create and we’ll continue posting them. You can find more automations in this post and this post. Also, if you have any suggestions for automations you’d like us to create and share in the future, please let me know in the comments. 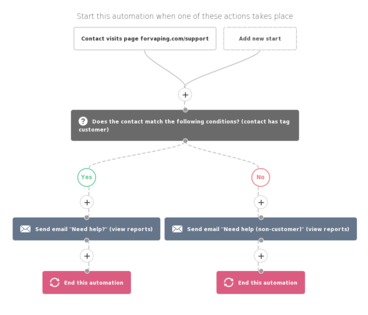 We’ll be posting new automation workflows for you regularly.